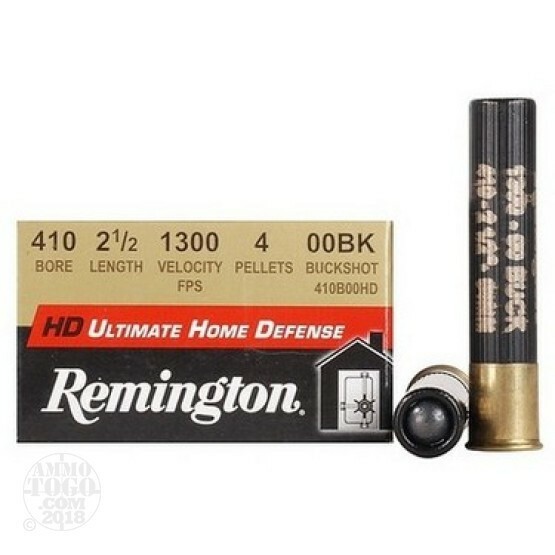 This is .410 Gauge Remington Ultimate Home Defense 2 1/2" 4 Pellet 00 Buckshot Ammo. Remington HD Ultimate Home Defense shotgun ammunition features the same pellet material as the popular Wingmaster HD tungsten-bronze hunting ammunition. Remington's .410 load packs four lead 00 buckshot pellets to maximize effectiveness with the highest terminal energy. Packed 15rds. per box.